1 How to reduce fat in meals? 1.2 What are the best habits to lose weight? How to reduce fat in meals? – 4 or 5 servings of vegetable food every day: It is considered one serving a cup of vegetable oil, or half a cup of cooked vegetable, or 180 g of vegetable juice. Among the most recommended plants it includes those rich in magnesium, potassium and fiber. For example: spinach, tomatoes, green beans, carrots, potatoes, bróculis, peas or squash. 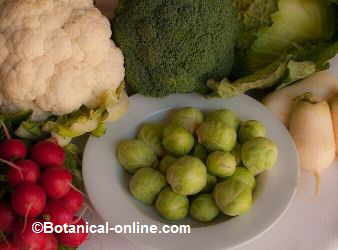 The vegetables provide fiber, magnesium and potassium very appropriate to reduce obesity. Vegetables are very rich in fiber, magnesium, potassium, calcium and antioxidants. – It is better to use chicken or turkey, and within these, the breast contains less fat than legs. You should cook chicken without skin. Turkey or chicken are better than the rest of meats for stews. – With regard to milk and dairy products, the best choice is to choose skimmed milk or derivatives from this type of milk.. This concerns both milk, which should be skimmed, or other milk derivatives such as yogurt, custard or ice cream. Milk cream is not a good friend if you want to lose weight or achieve your ideal weight. – To spread it is better to use “light” products such as cheese, margarine, or low fat content mayonnaise. It would be better for you to buy good quality bread, even better to get whole bread made with different cereals. This could avoid the usual habit of spreading butter or other oily industrial products on the bread . If you love to do it, it is better for you just to use tomato, and it should not be fried. – Dressings should be used with caution. It is better to add herbs or spices with a little oil. This will reduce the intake of fat, improve the taste of foods and provide medicinal properties to your diet. Some lemon juice, vinegar, apple sauce or tomato sauce, prepared at home, can be very interesting. Do not add butter to vegetables or fat-based dressings to meat or fish. – Do not eat too many eggs. As maximum you should eat 4 eggs a week. You can also eat egg whites occasionally instead of yolks. – Avoid eating cakes or bakery products, whole ice cream, cookies, chocolate or crisps. All these foods contain lots of fat. – Avoid fried foods. This type of meal absorbs much oil and involves eating lots of fat. Instead of them, it is better to prepare dishes with other techniques: steamed, boiled, grilled, broiled, etc. It is worth keeping in mind that 100 g of boiled potatoes provide 86 calories while the same amount of fried potatoes provides 156 calories. – Prevent the abuse and the habit of drinking alcohol. Alcohol should be taken in moderation because, in addition to a possible risk of alcoholism, it is a very caloric drink. A moderate use of certain alcoholic beverages, such as wine, may even have positive effects on health. What are the best habits to lose weight? – “Picking at your food ” between meals or after meals. It’s a bad habit to stay at the table after eating and eat cookies, chocolate or sweets. An after-lunch conversation can be accompanied with an infusion, eg, a green tea, a chamomile or mint. – Avoid salting foods: Salt encourages fluid retention and swell your body.